We have yet another announcement from NAMM 2019 for you now. 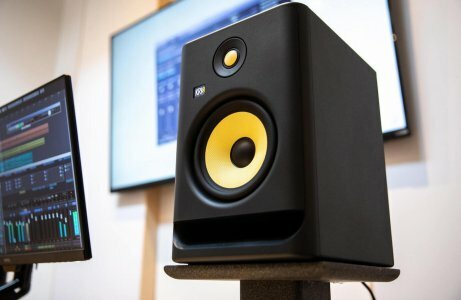 This time it’s from KRK Systems with their new G4 Rokit studio monitors. Anyone who’s previously come in to contact with these will know just how well they perform. So, there’ll be no surprises when we tell you that these 4th generations are even better. Combining stylish art with the science of sound, the new KRK Rokit G4s will take your sound creativity to a whole new level. With over 30 years’ experience in innovation and development, KRK has produced a monitor that’s designed to suit the way a modern artist works – in any genre. A great feature with the G4s is the inclusion of the KRK App. Compatible with both Android and iPhone, you can now visualize the EQ settings with an LCD graph, as well as receiving helpful spectral analysis. By the same token, the app helps with speaker placement, level matching, subwoofer level and crossover setting assistance, polarity, EQ, and even has a Signal Generator. The KRK’s matching driver design makes sure each frequency receives the same song integrity throughout the full spectrum. This goes a long way to giving you a balanced listening experience and helps reduce listening fatigue. Additionally, the KRK’s new proprietary drivers feature a malleable strength-to-weight ratio material known for superb high-end sound reproduction. The newly designed front-firing port gives the low resonance speaker exceptional low-end punch with flexible room positioning. And, the high-density open cell acoustic iso-foam pads decouple the speaker from the surface, minimizing the transmitted vibration and improving the overall clarity and listening experience. Furthermore, the fluid mechanics that are fully in tune with the whole system and deliver constant air pressure at any volume. This results in an unusually wide, deep and dynamic listening sweet spot and 3D soundstage. At the core of the whole beast is the powerful, newly designed custom class D amplifier. It drives the speakers evenly and efficiently and retains fantastic audio integrity. Furthermore, a custom built-in Brickwall limiter is employed automatically at the maximum amp level, maintaining a balanced sound that protects the system and delivers better dynamics with a wider range.